“He also spoke about the Port Arthur massacre, where 35 people were killed and 23 wounded by gunman Martin Bryant just eight weeks after he was elected. Mr Howard revealed he believed the government’s gun control reforms in response to the tragedy were part of the reason One Nation’s political “insurgency” gained ground in the late 1990s. But there was never any doubt that he had to try to secure the national gun control laws despite “genuine push back” from parts of his own government and from regional voters, particularly in Queensland and Western Australia. “I believed overwhelmingly that if you couldn’t do this, and you weren’t prepared to chance it, what’s the point of being in government,” Mr Howard said. He was in Sydney when he learnt about the massacre and travelled to Canberra that night for an emergency meeting. “It was there that I started thinking about national gun laws,” Mr Howard said. “It was a terrible tragedy and to this day I remember going down to Port Arthur. It was a very early reminder for me that one of the jobs of the prime minister is to comfort and console and hug people who have had a big tragedy and what you have to do in a situation like that is to act natural and don’t hold back but also keep in control of your emotions. What lies. Howard freely admitted in 2016 that he had the laws ready to go and was just waiting for the right time to introduce them. Declassified Cabinet papers from November 1991 showed that an attempt by Labor and Police Commissioners was made in 1991 to grab Australia’s guns but were rebuked by state governments, and Howard had literally copied and pasted them. Hilarious of Howard to call for a mature debate on immigration when he was the one who opened the front door that has led to the social and economic problems we have now. More importantly, it’s intensely hypocritical of Howard to call for a mature debate when he never allowed one, or indeed a vote, on the National Firearms Agreement or anything to do with firearms. Not to mention subverting the Constitution by blackmailing the states into passing the non-legally binding agreement by withholding federal funding. The question remains, if Bryant is so overwhelmingly guilty then the release of the trial evidence would be of no consequence to his conviction and confession and just confirm what we’ve already been told repeatedly. 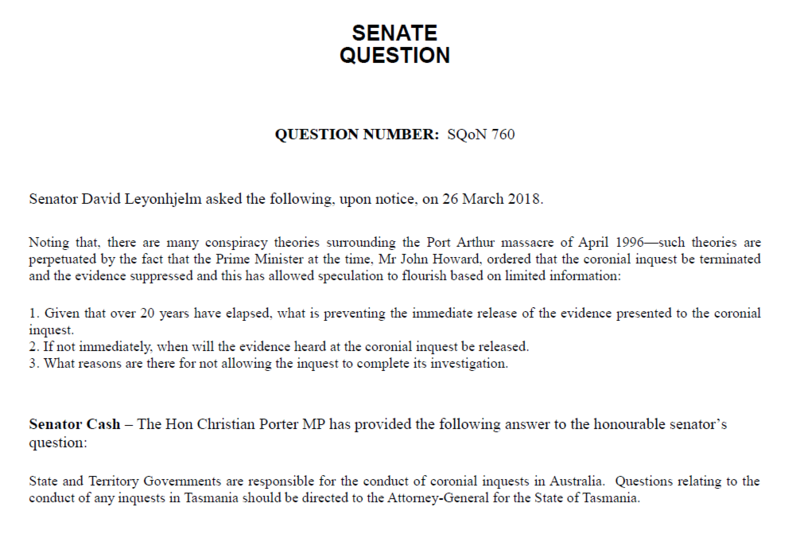 There are plenty of valid questions still to be asked about Port Arthur and valid questions of an event so politicised should be the subject of investigation and inquiry, not the subject of ridicule and dismissal. The fact that the records are sealed until 2023 says it all. I’m sure John and Tim Fischer are both hoping for a pre-2023 departure. If you’re going to keep bringing up Port Arthur John, then it should only ever be in the context of a proper Inquiry or Royal Commission. Otherwise, just do us all a favour and quite frankly, piss off. Don’t count on the suppression order being lifted. It will be extended. The true ‘conspiracy’ surrounding port Arthur is simply this. It put paid to the lie that “the police are there to protect the public”. The PA massacre had every bit as much to do with poor police response and rank incompetency of emergency services, as what it had to do with gun control. That is what he suppression order has so successfully concealed for all these years. I certainly agree with Dean here, the conspiracy has been to cover up police incompetence and the fact that the Federal Govt exploited that incompetence to subvert the rights of the states.